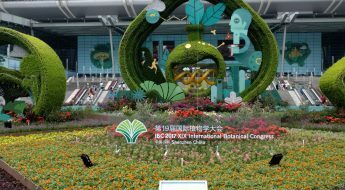 A version of this article first appeared in the Council on Botanical and Horticultural Libraries (CBHL) May 2018 Newsletter. “The Librarian’s Nightmare.” Vignette by George Cruikshank for James Bateman’s The Orchidaceae of Mexico and Guatemala (-1843). Contributed in BHL by the Peter H. Raven Library of the Missouri Botanical Garden. Such is the name given to a delightful and quirky vignette found within a very rare, and very special, orchid book: James Bateman’s The Orchidaceae of Mexico and Guatemala (-1843). 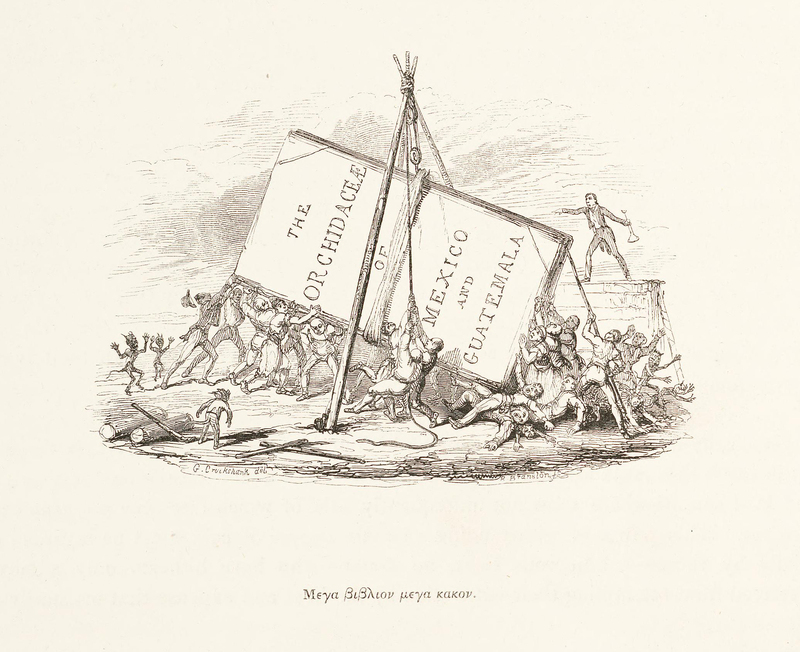 This vignette, the work of caricaturist George Cruikshank, depicts a group of men struggling to lift an enormous book using a pulley system while a harried taskmaster with a megaphone attempts to direct their work and demons dance about with impish glee on the sidelines. The vignette’s caption, translated from the Greek, reads “a big book is a big evil” (Bleichmar 2017, 179). The scene is a humorous commentary on the massive size of Bateman’s orchid book. At about 30” x 22” (Cobbledick 2018a) and weighing in at over 38 lbs (Hamilton 1990, 1244), it is the “largest botanical book ever produced with lithographic plates” (Blunt and Stearn 1994, 249). Plate 19. Bateman, James. The Orchidaceae of Mexico and Guatemala. Illustration drawn by Sarah Anne Drake and lithographed by Maxim Gauci. Contributed in BHL by the Peter H. Raven Library of the Missouri Botanical Garden. The Orchidaceae of Mexico and Guatemala was produced in the midst of the Victorian era’s “orchid mania” or “Orchidelirium”, characterized by European obsession with collecting and cultivating exotic orchid species. Wealthy orchid enthusiasts commissioned collectors to travel the world in search of new and rare specimens. James Bateman was such an enthusiast. A wealthy British landowner and passionate horticulturalist, Bateman employed collectors to obtain new specimens for him, particularly from South and Central America (Sitwell and Blunt 1990, 45). It was his relationship with a merchant operating in Guatemala that enabled Bateman to secure many of the orchids featured in his magnificent folio. Plate 13. Bateman, James. The Orchidaceae of Mexico and Guatemala. Illustration drawn by Augusta Withers and lithographed by Maxim Gauci. Contributed in BHL by the Peter H. Raven Library of the Missouri Botanical Garden. George Ure Skinner, born into a scholarly English family, established an export business in Guatemala in the 1830s, and in his free time, collected local birds and insects for the Museum of Natural History in Manchester, England. 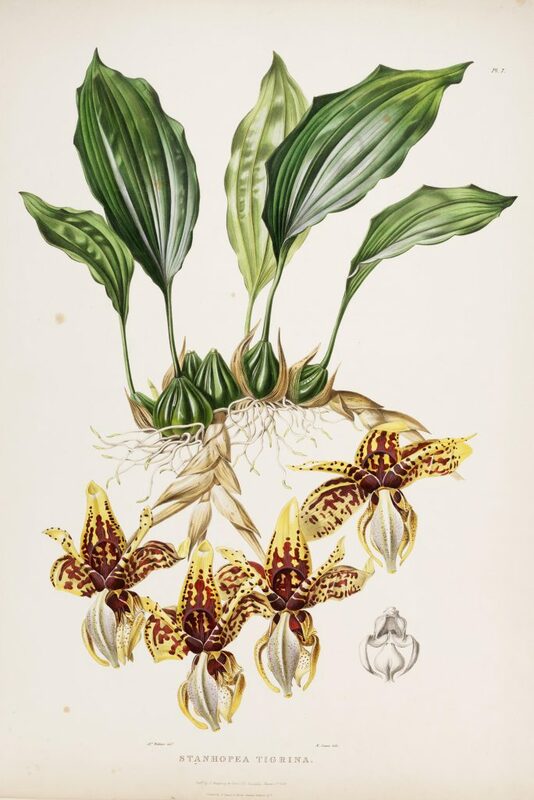 After receiving a letter from Bateman requesting orchids from the region, Skinner began collecting and shipping back new and stunning specimens hitherto unknown to the European public. These specimens formed the foundation of Bateman’s orchid masterpiece (Schmidt-Ostrander 2018). Plate 6. Bateman, James. The Orchidaceae of Mexico and Guatemala. Illustration drawn by Augusta Withers and lithographed by Maxim Gauci. Contributed in BHL by the Peter H. Raven Library of the Missouri Botanical Garden. 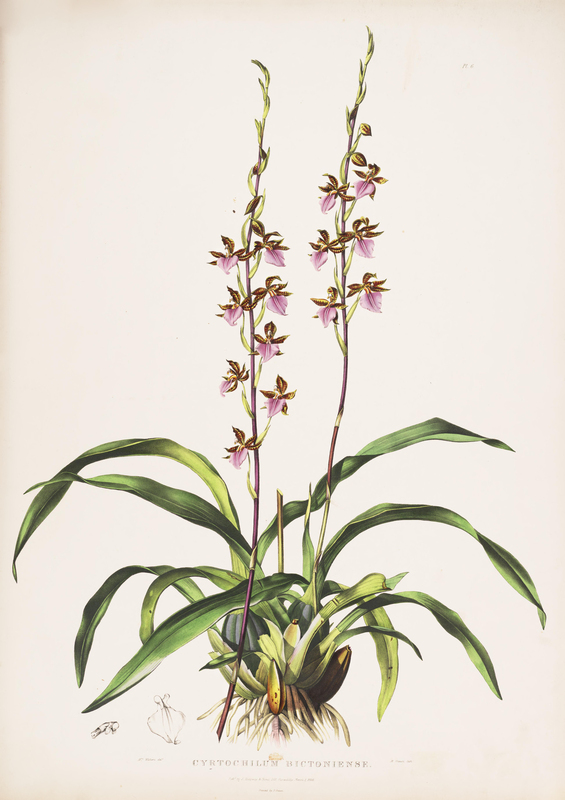 Within The Orchidaceae of Mexico and Guatemala, Bateman provided scientific descriptions in English and Latin as well as practical cultivation information for the species presented in the book. Also, according to Amy Pool, Curatorial Assistant at the Missouri Botanical Garden, 11 new-to-science species of orchids were validly published in this work. She estimates that it presented the first published illustrations for 90% of the 40 species included. Plate 40. Bateman, James. The Orchidaceae of Mexico and Guatemala. Illustration drawn by Sarah Anne Drake and lithographed by Maxim Gauci. Contributed in BHL by the Peter H. Raven Library of the Missouri Botanical Garden. 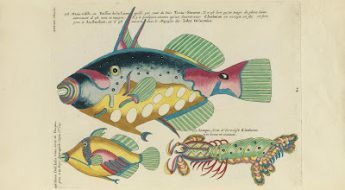 The work is particularly noteworthy for its colorful (and sizeable) lithographic plates. Numbering 40 in total, these lithographs were executed by Maxim Gauci based on drawings largely by Sarah Anne Drake and Augusta Withers, with two drawings by Jane Edwards and one by Samuel Holden. These illustrations were based on the live specimens in Bateman’s and his friends’ greenhouses. The hand-colored elements of the lithographs add dimension and richness to the orchid forms, particularly through the application of varnish which provides deeper tones (Cobbledick 2018b). The Orchidaceae of Mexico and Guatemala was issued in parts between 1837-43 and printed in a limited edition of 125 copies sold to subscribers (Bleichmar 2017, 179). Today, fewer than 55 copies are known to exist. Plate 7. Bateman, James. The Orchidaceae of Mexico and Guatemala. Illustration drawn by Augusta Withers and lithographed by Maxim Gauci. Contributed in BHL by the Peter H. Raven Library of the Missouri Botanical Garden. One of those copies can be found in the world-renowned Rare Book Collection of the Peter H. Raven Library of the Missouri Botanical Garden. Happily, this copy has been digitized in the Biodiversity Heritage Library and is now freely available to the world. The Missouri Botanical Garden recently featured an exhibit about The Orchidaceae of Mexico and Guatemala. 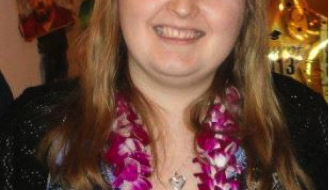 Image credit: Lauren Peters. 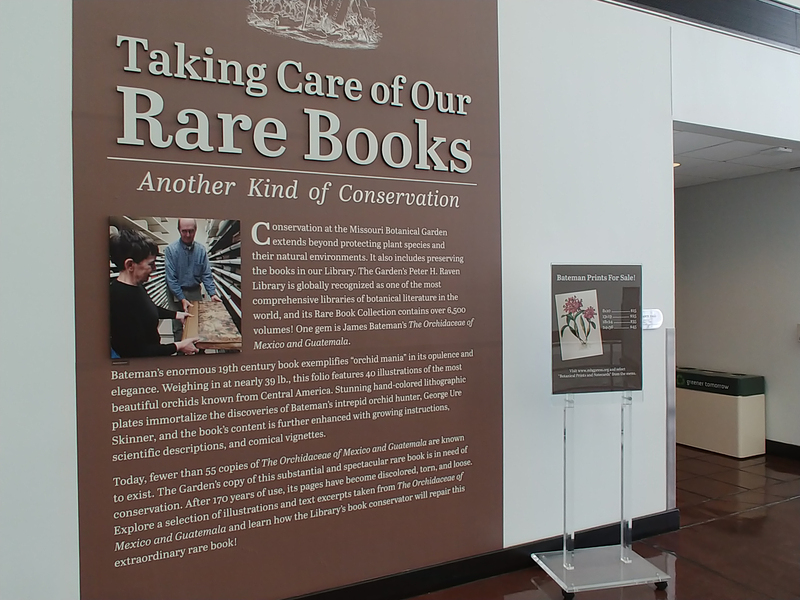 Earlier this year, the Missouri Botanical Garden produced an exhibit on book conservation, entitled: Taking Care of Our Rare Books: Another Kind of Conservation. This ran concurrent with the Garden’s annual orchid show, the 2018 theme being “Orchid mania.” Both featured The Orchidaceae of Mexico and Guatemala. 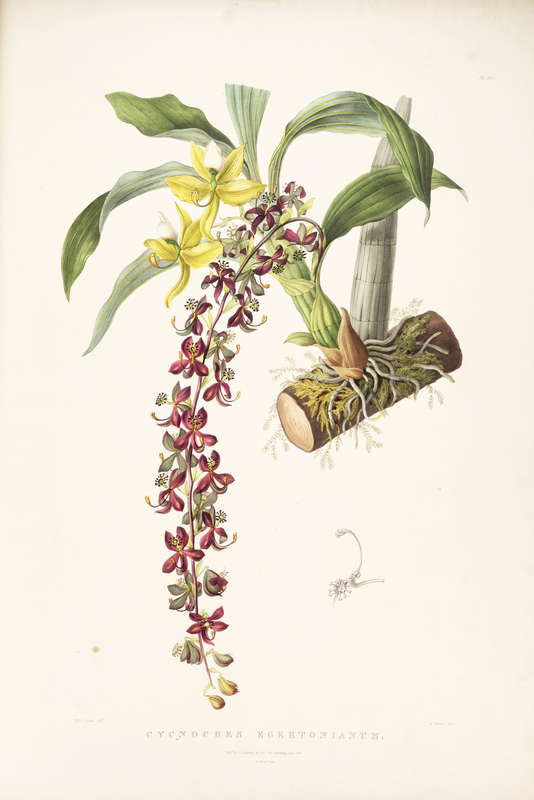 The floral show included numerous images from the book and described its role in “orchid mania”, and the exhibit featured a selection of images and text excerpts from the publication while highlighting book conservation techniques and principles. At nearly 200 years old, and having been acquired by the Library in 1895 during a period of heavy pollution in Saint Louis, it is not surprising that the Missouri Botanical Garden’s copy of Bateman’s work is in poor condition, with ripped and soiled paper, loose pages, and broken binding. The Library’s book conservator, Susie Cobbledick, has begun a substantial restoration project for this work. This process was not only highlighted as part of the Garden’s exhibit, but it is also being recorded through a series of posts on the Garden’s Discover + Share website. This process includes repairing the volume’s binding and cleaning and mending the paper. As Cobbledick articulates, the Library’s copy had been rebound at least once, and past attempts to repair the binding have failed under the strain imposed by such a massive volume. Additionally, the original covers were replaced with Masonite board at some point in the 20th century. As part of the Library’s conservation process, a more robust binding structure will be created for this volume, and more appropriate covers may be used to replace the inadequate Masonite (Cobbledick 2018a). The soiled pages also require special attention. In order to remove the dirt and other residue that has accumulated over the past 170+ years without altering or damaging the lithographs’ fragile surfaces, Cobbledick is employing dry cleaning methods using cosmetic sponges and white vinyl erasers to carefully clean each page. This time-consuming process will take several months to complete (Cobbledick 2018b). 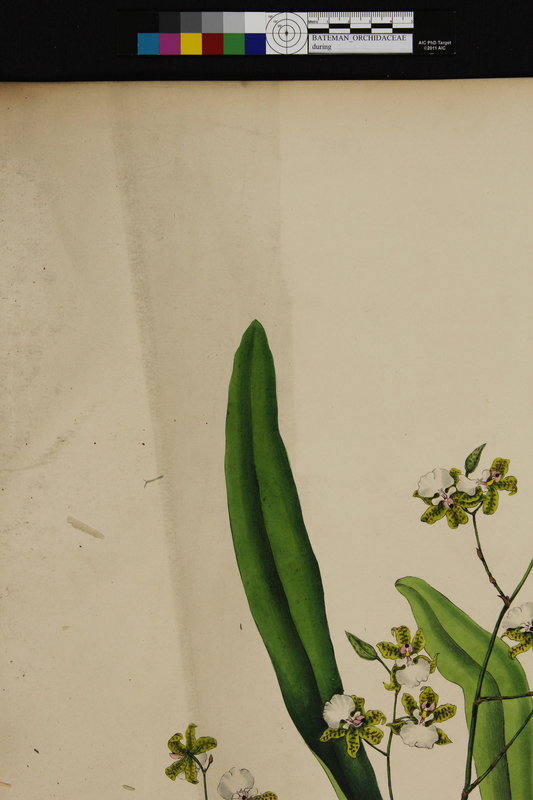 Cosmetic sponges and white vinyl erasers are used to clean the lithographs within the Garden’s copy of The Orchidaceae of Mexico and Guatemala. In this photo, you can see a cleaned (right-hand side) and uncleaned (left-hand side) portion of a plate from the book. Image Credit: Susie Cobbledick. 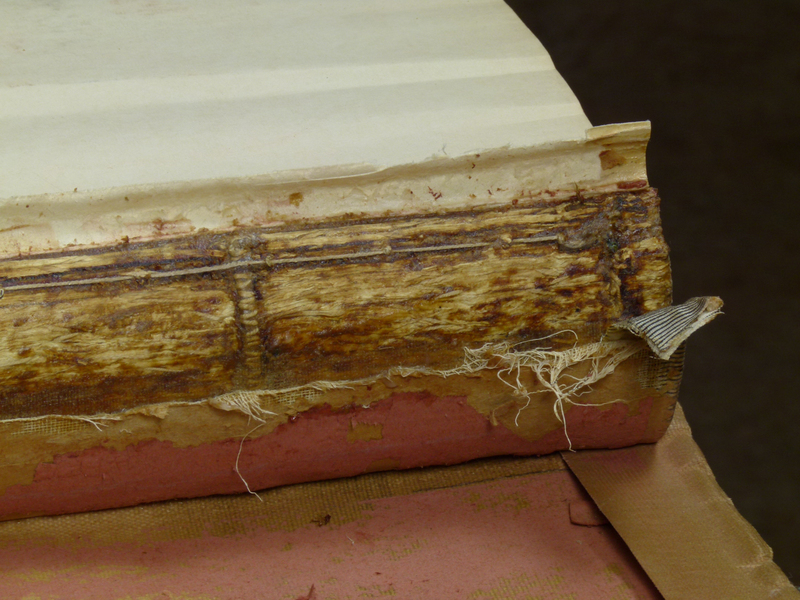 Conservators have also begun mending the volume’s ripped and damaged paper. As part of this process, they are conducting tests to determine whether the type of sizing (substance added to paper to make it less absorbent) used has contributed to the poor condition of the book’s paper today. The answer may be related to whether or not the paper was machine-made. Explore the testing process and initial outcomes in the most recent “Rebuilding the Bateman Book” post. To learn more about the restoration process for The Orchidaceae of Mexico and Guatemala and follow the conservation work, explore the entire “Rebuilding the Bateman Book” series on the Garden’s Discover + Share website. The Orchidaceae of Mexico and Guatemala is truly a scientific, bibliographic, and artistic marvel. 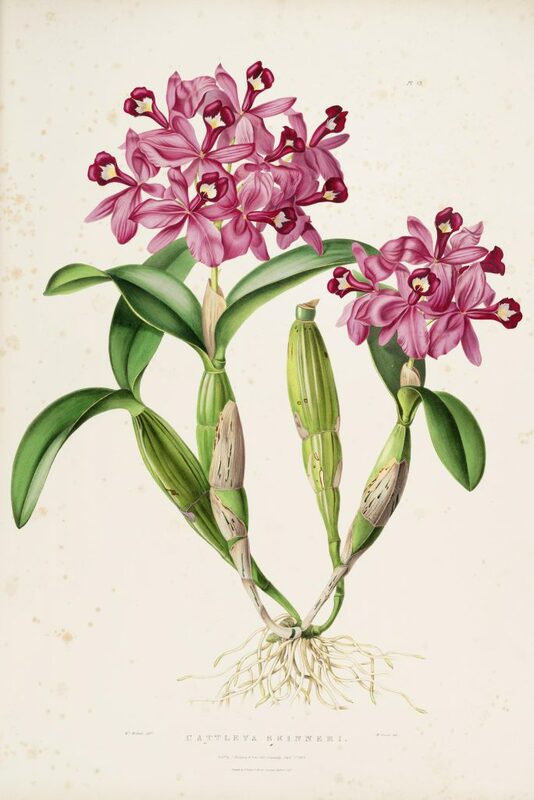 Through its unique blend of scientific information, awe-inspiring illustrations, and unexpected humor, Bateman’s orchid masterpiece stands out as a truly remarkable entry in the annals of natural history. 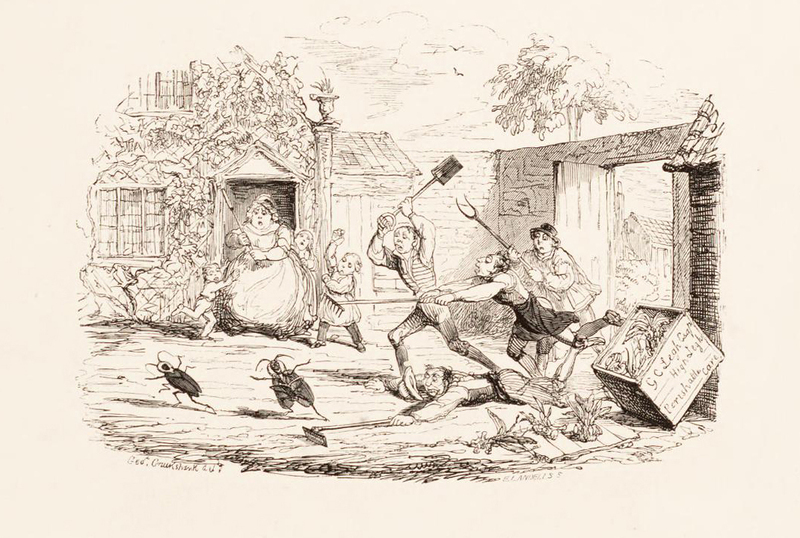 As another example of humor within The Orchidaceae of Mexico and Guatemala, this vignette by George Cruikshank depicts a pair of gigantic cockroaches escaping from a box meant to contain orchid specimens whilst the gardener’s family and assistants chase the unwelcome intruders. What some might call “The Librarian’s Nightmare”, we call “The Book Lover’s Dream”. 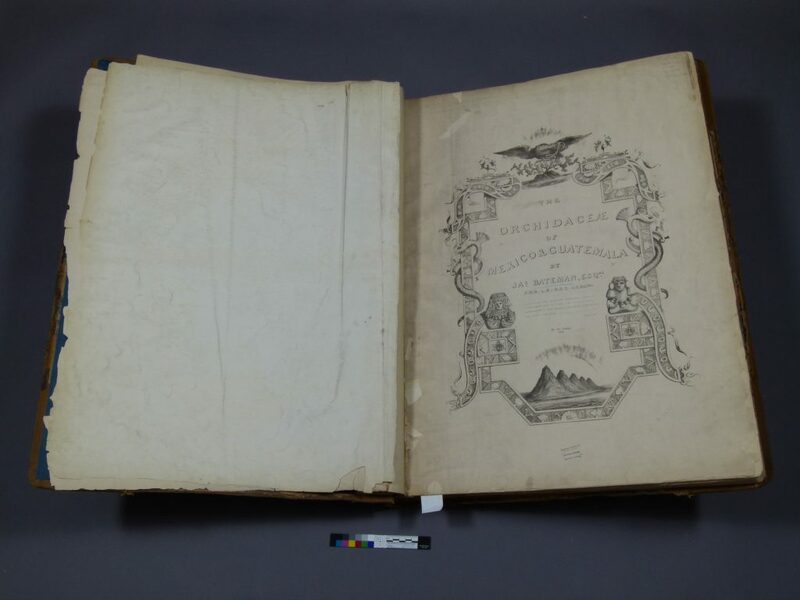 We are grateful to the Peter H. Raven Library of the Missouri Botanical Garden for making this title freely available in BHL and are thrilled that the Library’s current conservation efforts will ensure that future generations can enjoy this treasure. Taking Care of Our Rare Books: Another Kind of Conservation was curated by Missouri Botanical Garden staff Lauren Peters (Science Communication Specialist), Amy Pool (Curatorial Assistant, Herbarium), and Susie Cobbledick (Book Conservator, Library) and designed by Ellen Flesch (Supervisor, Creative Services) based on an exhibit proposal by Doug Holland (Director, Peter H. Raven Library). Learn more about the exhibit. Post by Grace Costantino (Outreach and Communication Manager, Biodiversity Heritage Library) with significant contributions from Susie Cobbledick (Book Conservator, Peter H. Raven Library of the Missouri Botanical Garden) and Amy Pool (Curatorial Assistant, Herbarium, Missouri Botanical Garden). Bleichmar, Daniela. 2017. Visual Voyages: Images of Latin American Nature from Columbus to Darwin. New Haven, CT: Yale University Press. Blunt, Wilfrid and William T. Stearn. 1994. 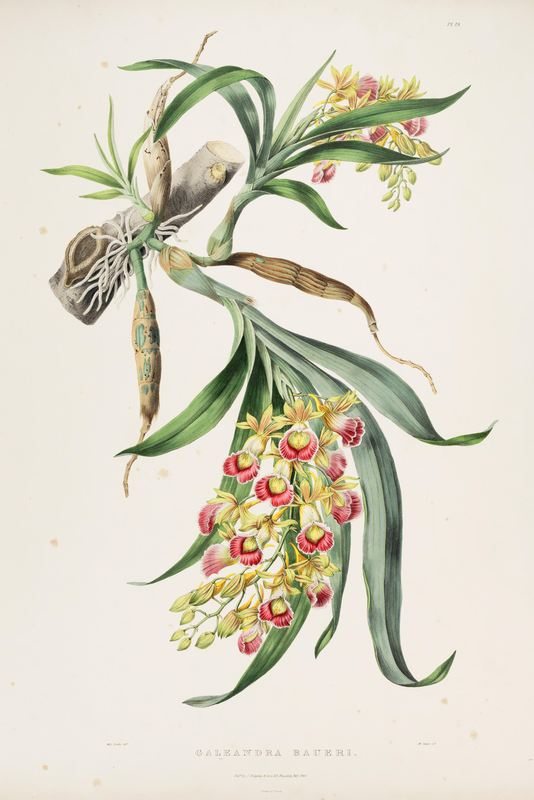 The Art of Botanical Illustration. New Edition. Suffolk: Antique Collectors’ Club, Ltd.
Cobbledick, Susie. 2018a. “From the Library: Rebuilding the Bateman Book (Part 1).” Discover + Share. February 17. Accessed March 29, 2018. https://discoverandshare.org/2018/02/17/from-the-library-rebuilding-the-bateman-book-part-1/. Cobbledick, Susie. 2018b. “From the Library: Rebuilding the Bateman Book (Part 2).” Discover + Share. March 22. Accessed March 29, 2018. https://discoverandshare.org/2018/03/22/from-the-library-rebuilding-the-bateman-book-part-2/. Hamilton, Robert M. 1990. “Skinner and Bateman – 1: Introduction.” American Orchid Society Bulletin 59, no. 12 (December): 1235-1247. Schmidt-Ostrander, Ingrid. 2018. “George Ure Skinner (1804 – 1867).” Victorian Orchid Society. Accessed March 29, 2018. http://victoriaorchidsociety.com/Ingrid/Skinner.html. Sitwell, Sacheverell and Wilfrid Blunt. 1990. Great Flower Books: 1700-1900. New York: The Atlantic Monthly Press. Enjoyed the Cruikshank humor. And Bateman’s botanical and horticultural legacies can not be overestimated. Thank you for an informative and lighthearted read. We’re so pleased you liked the post! Bateman’s book is certainly a delight not only scientifically and artistically, but also for the unexpected humor interspersed throughout. We’re extremely grateful to the Peter H. Raven Library of the Missouri Botanical Garden for contributing it to our collection!